Massive 'Doughnut' Reef Discovered Behind Australia's Great Barrier Reef : The Two-Way The reef structure covers more than 2,000 square miles north of the Great Barrier Reef. What might live there and even what it looks like up close, is still largely a mystery. The Great Barrier Reef off the coast of Queensland, Australia, in August 2009. Scientists say they have discovered a second, enormous reef in the deeper water behind the Great Barrier Reef. From the air, it looks like a 2,300-square-mile field of submerged doughnuts on the ocean floor. The limestone circles amount to a second, deeper reef behind the Great Barrier Reef, researchers say. The scientists who discovered it off the coast of northern Australia say they're surprised by its vast size — and by the strange shapes. "When the three-dimensional shape of them was revealed, it was really surprising," lead author Mardi McNeil of the University of Queensland tells the Australian broadcaster ABC. "They form these fields of doughnut-shaped structures ... sometimes they're like singular circular rings, sometimes in groups of three or four," she adds. The "they" McNeil refers to is an algae called Halimeda. When Halimeda is alive, it's green. When it dies, it turns into white, flaky limestone pieces that look like cornflakes. The flakes build up over time — the newly discovered reef likely goes back 10,000 years — and can make doughnut-shaped mounds 30 feet tall and 600 feet across. The findings were published in the journal Coral Reefs. Those mounds, known as Halimeda bioherms, stretch much farther along the northern Australian coast than anyone expected. Scientists who study the shallow coast beyond the Great Barrier Reef — the so-called inter-reef area — knew the large mounds of dead algae existed for decades, but they had previously thought the ecosystem covered about 800 square miles. The new finding triples that area. A northwesterly view of the Bligh Reef area off Cape York in northern Australia. Depths are red (shallow) to blue (deep), over a depth range of about 150 feet. The green area shows the newly discovered doughnut-shaped structures created by algae. One of the study authors, Robin Beaman of James Cook University, says in a press release, "We've known about these geological structures in the northern Great Barrier Reef since the 1970s and '80s, but never before has the true nature of their shape, size and vast scale been revealed." 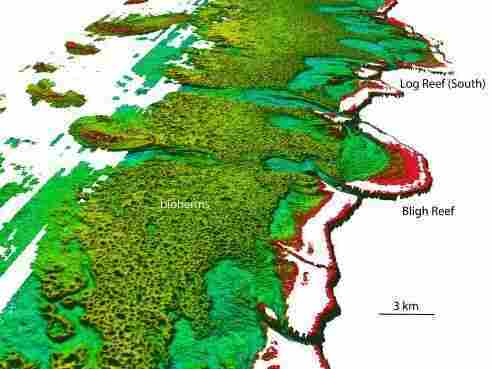 The team used laser image data that the Australian navy gathered by plane to make a 3-D map of the ocean floor. Using laser imaging to map coral reefs isn't new. The U.S. Geological Survey and the National Oceanic and Atmospheric Administration have used planes carrying laser imaging systems to make 3-D maps of reefs off the coast of Florida in Biscayne National Park, Dry Tortugas National Park and the NOAA Florida Keys National Marine Sanctuary. 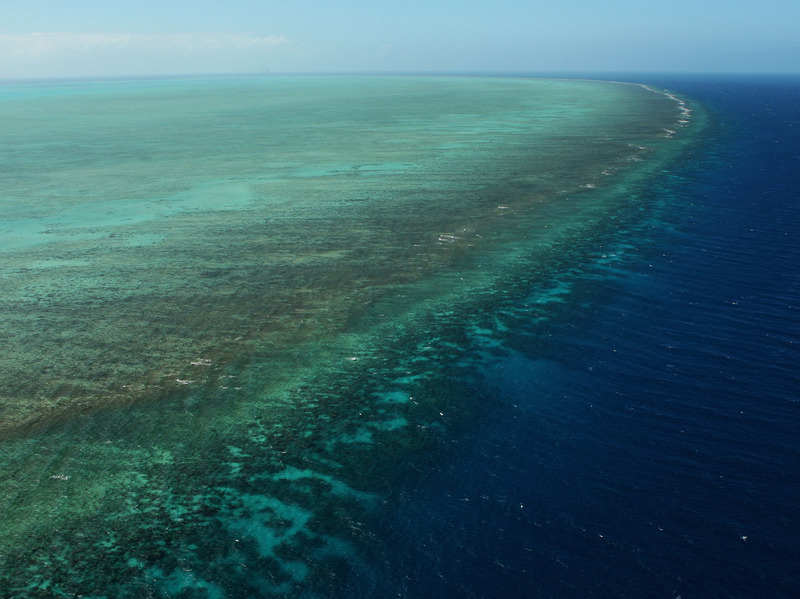 The new discovery could be helpful for scientists trying to understand the climate history on the Great Barrier Reef. As the algae lives, dies and calcifies, it forms layer upon layer of fossilized information on about 10,000 years of living conditions in the ocean. "Just like tree rings — the rings can tell you the age of when it was formed and the environment it was formed in. So you've got 20 meter-thick piles of sediment that can tell you an awful lot about past oceanographic history," Beaman tells ABC. And then there's the question of what lives there today. Because the new reef is 60 feet to 150 feet deep, very few people have ever seen any part of it. McNeil says those who have dived there came back with different accounts. Everything from, " 'they're covered in this lush thick veneer of living green,' " she tells ABC, "to 'just white limestone flakes, like a white desert.' "